I’m still surprised by the amount of confusion around Apple’s CPU cores, so that’s where I’ll start. I’ve already outlined how ARM’s business model works, but in short there are two basic types of licenses ARM will bestow upon its partners: processor and architecture. The former involves implementing an ARM designed CPU core, while the latter is the creation of an ARM ISA (Instruction Set Architecture) compatible CPU core. NVIDIA and Samsung, up to this point, have gone the processor license route. They take ARM designed cores (e.g. Cortex A9, Cortex A15, Cortex A7) and integrate them into custom SoCs. In NVIDIA’s case the CPU cores are paired with NVIDIA’s own GPU, while Samsung licenses GPU designs from ARM and Imagination Technologies. Apple previously leveraged its ARM processor license as well. 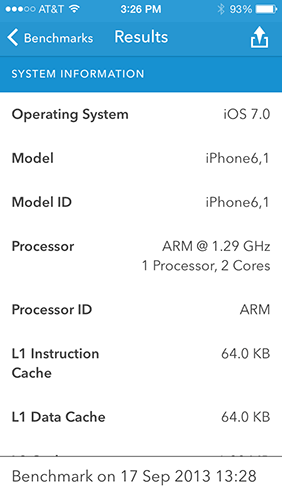 Until last year’s A6 SoC, all Apple SoCs leveraged CPU cores designed by and licensed from ARM. With the A6 SoC however, Apple joined the ranks of Qualcomm with leveraging an ARM architecture license. At the heart of the A6 were a pair of Apple designed CPU cores that implemented the ARMv7-A ISA. I came to know these cores by their leaked codename: Swift. At its introduction, Swift proved to be one of the best designs on the market. An excellent combination of performance and power consumption, the Swift based A6 SoC improved power efficiency over the previous Cortex A9 based design. Swift also proved to be competitive with the best from Qualcomm at the time. Since then however, Qualcomm has released two evolutions of its CPU core (Krait 300 and Krait 400), and pretty much regained performance leadership over Apple. Being on a yearly release cadence, this is Apple’s only attempt to take back the crown for the next 12 months. 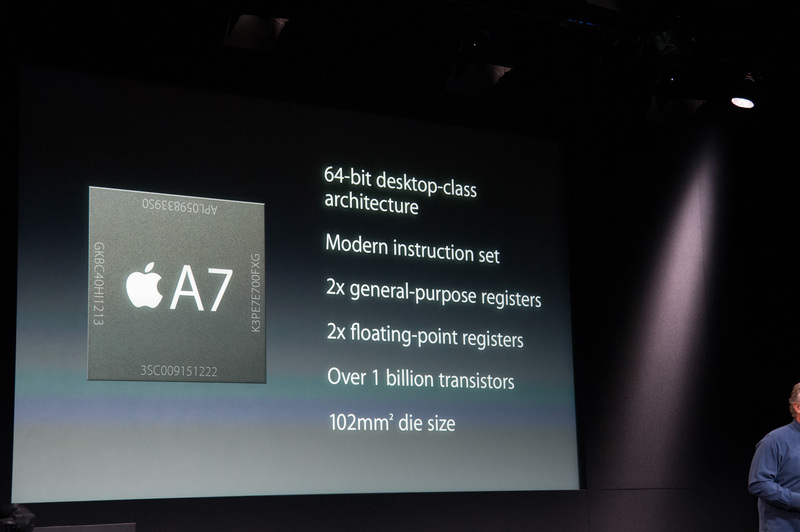 Following tradition, Apple replaces its A6 SoC with a new generation: A7. With only a week to test battery life, performance, wireless and cameras on two phones, in addition to actually using them as intended, there wasn’t a ton of time to go ridiculously deep into the new SoC’s architecture. Here’s what I’ve been able to piece together thus far. First off, based on conversations with as many people in the know as possible, as well as just making an educated guess, it’s probably pretty safe to say that the A7 SoC is built on Samsung’s 28nm HK+MG process. It’s too early for 20nm at reasonable yields, and Apple isn’t ready to move some (not all) of its operations to TSMC. The jump from 32nm to 28nm results in peak theoretical scaling of 76.5% (the same design on 28nm can be no smaller than 76.5% of the die area at 32nm). In reality, nothing ever scales perfectly so we’re probably talking about 80 - 85% tops. Either way that’s a good amount of room for new features. At its launch event Apple officially announced both die size for the A7 (102mm^2) as well as transistor count (over 1 billion). Don’t underestimate the magnitude of both of these disclosures. The technical folks at Cupertino are clearly winning some battle to talk more about their designs and not less. We’re not yet at the point where I’m getting pretty diagrams and a deep dive, but it’s clear that Apple is beginning to open up more (and it’s awesome). Apple has never previously disclosed transistor count. I also don’t know if this “over 1 billion” figure is based on a schematic or layout transistor count. The only additional detail I have is that Apple is claiming a near doubling of transistors compared to the A6. Looking at die sizes and taking into account scaling from the process node shift, there’s clearly a more fundamental change to the chip’s design. It is possible to optimize a design (and transistors) for area, which seems to be what has happened here. The CPU cores are, once again, a custom design by Apple. These aren’t Cortex A57 derivatives (still too early for that), but rather some evolution of Apple’s own Swift architecture. I’ll dive into specifics of what I’ve been able to find in a moment. To answer the first question on everyone’s mind, I believe there are two of these cores on the A7. Before I explain how I arrived at this conclusion, let’s first talk about cores and clock speeds. I always thought the transition from 2 to 4 cores happened quicker in mobile than I had expected. Thankfully there are some well threaded apps that have been able to take advantage of more than two cores and power gating keeps the negative impact of the additional cores down to a minimum. As we saw in our Moto X review however, two faster cores are still better for most uses than four cores running at lower frequencies. NVIDIA forced everyone’s hand in moving to 4 cores earlier than they would’ve liked, and now you pretty much can’t get away with shipping anything less than that in an Android handset. Even Motorola felt necessary to obfuscate core count with its X8 mobile computing system. Markets like China seem to also demand more cores over better ones, which is why we see such a proliferation of quad-core Cortex A5/A7 designs. Apple has traditionally been sensible in this regard, even dating back to core count decisions in its Macs. I remembering reviewing an old iMac and pitting it against a Dell XPS One at the time. This was in the pre-power gating/turbo days. Dell went the route of more cores, while Apple chose for fewer, faster ones. It also put the CPU savings into a better GPU. You can guess which system ended out ahead. In such a thermally constrained environment, going quad-core only makes sense if you can properly power gate/turbo up when some cores are idle. I have yet to see any mobile SoC vendor (with the exception of Intel with Bay Trail) do this properly, so until we hit that point the optimal target is likely two cores. You only need to look back at the evolution of the PC to come to the same conclusion. Before the arrival of Nehalem and Lynnfield, you always had to make a tradeoff between fewer faster cores and more of them. Gaming systems (and most users) tended to opt for the former, while those doing heavy multitasking went with the latter. Once we got architectures with good turbo, the 2 vs 4 discussion became one of cost and nothing more. I expect we’ll follow the same path in mobile. Then there’s the frequency discussion. Brian and I have long been hinting at the sort of ridiculous frequency/voltage combinations mobile SoC vendors have been shipping at for nothing more than marketing purposes. I remember ARM telling me the ideal target for a Cortex A15 core in a smartphone was 1.2GHz. Samsung’s Exynos 5410 stuck four Cortex A15s in a phone with a max clock of 1.6GHz. The 5420 increases that to 1.7GHz. The problem with frequency scaling alone is that it typically comes at the price of higher voltage. There’s a quadratic relationship between voltage and power consumption, so it’s quite possibly one of the worst ways to get more performance. Brian even tweeted an image showing the frequency/voltage curve for a high-end mobile SoC. Note the huge increase in voltage required to deliver what amounts to another 100MHz in frequency. The combination of both of these things gives us a basis for why Apple settled on two Swift cores running at 1.3GHz in the A6, and it’s also why the A7 comes with two cores running at the same max frequency. Interestingly enough, this is the same max non-turbo frequency Intel settled at for Bay Trail. Given a faster process (and turbo), I would expect to see Apple push higher frequencies but without those things, remaining conservative makes sense. I verified frequency through a combination of reporting tools and benchmarks. While it’s possible that I’m wrong, everything I’ve run on the device (both public and not) points to a 1.3GHz max frequency. Now the question is, what’s changed in these cores? As a programmer I say there is a HUGE fragmentation problem with all the Androids. So you must have taken "apple fanboys" personally, and understandably "declining sales" in a context regarding apples conflicts you. Like all other vendors, apple sales drop, thus the periodic refreshes, which do need their selling points, this time around it is v8. In the past, apple resorted to similar strategies, like making exclusive deals, purchasing the entire initial batches of new generation parts, and again making up for the cost of this "innovation" with their profit margins. Weird---seems to me EVERY time an iPhone is released, it sells MORE than the previous version FASTER! In fact, it's never been surpassed by another electronic item in history...and it's sales continue to climb. News Flash! Android (High end; S4/Note/HTC 1/XPeria) also sell @ a premium and almost @ the exact price of Apple's handsets. The rest of your post is nonsense. It's not just Anand's site and review praising the performance of the A7---it's ubiquitous. Is Apple paying Ars? TechCrunch? MacRumors? WSJ? Engadget? CNet? Dude---this is one HELL of an SoC. It's so much MORE than a 64bit chess match. A company licensing and building from the ground up a CPU/GPU/IPU that matches their OS and allows the tools to developers (For Free!) in XCode so the transition is seamless! The speed of this chip is awesome. Setting themselves up early is smart---the iPad release is imminent and has competition from both sides...Microsoft and Android. With a significantly larger 'body' and area to allow for more RAM...and future releases of other ARM based products, Apple is making in-roads within the mobile sector that ONLY bozos that cherish other brands, OEMs, or otherwise have some weird bone to pick with Apple can't realize. Mind blowing. I'm brand agnostic---use OSx, Windows and even own a couple of Android devices....but to me as dismissive as you are about the A7s build and putting it in a product the size of a pack of smokes is about as silly and should I say 'ignorant' a stance as I've seen in a long LONG time. This move by Apple is HUGE. Moore's law now attributed to mobile. Still a dual core. Still 1GB of RAM (albeit DDR3 vs DDR2)---yet doubling, tripling, sometimes quadrupling performance of the other 'off the shelf' SoCs on the market that other OEMs are using. It's no secret---Apple has been hiring and head hunting chip designers from Intel and AMD for some time now. These guys and gals are some of the brightest minds on earth....but you've got it all figured out and somehow Anand's been blinded by the conspiracy---as has EVERY other reviewer on the 'net.